Follow the tips below to make sure your family and home are ready for a happy, clean spring season. Outdoor entertaining season is just around the corner. For outdoor cushions, saturate a sponge with a mixture of dishwashing detergent, warm water and Borax. Testing your smoke alarms and CO detectors, and changing out batteries as needed, is cheap, only takes a few minutes and can save your family’s lives. You can’t have a successful garden without good soil. Go to your locally-owned garden center or greenhouse and get some great tips. Your grill has most likely collected dust during fall and winter. Help your grill live a long life by following the manufacturer’s directions, whether you have a charcoal or gas grill. A house with a crawl space has vents along the foundation walls. The screens will have collected leaves and other debris from this past fall and winter. You can clean the vents by hand or use a shop vacuum. And be sure to repair any damaged screens — mice, all the way to squirrels and skunks, get through even the smallest holes. Keep dust, mold and pollen at bay by decluttering your home, checking pipes for leaks and keeping the air clean. Use outdoor sprayer solution for the upstairs windows, or simply hire a window cleaning service. A clogged dryer vent can be a fire hazard. Disconnect the vent from the back of the machine and use a dryer vent brush to remove lint to clean it. On the outside of your house, remove the dryer vent cover and use the brush to remove lint . And make sure the vent cover flap moves freely. 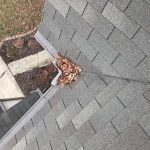 Grab a ladder, and a buddy to hold the ladder in place, and check your gutters for debris. Remove as much as you can with your hands, then remove any leftover gunk with a garden hose. Don’t forget the downspout by shoving in the hose to power out of gooseneck bends. We also offer a convenient Care & Maintenance Program that includes an annual roof inspection and tune-up, plus gutter cleaning. It’s an affordable way to get the peace of mind that comes from knowing that the best roofing contractor in Columbus is caring for your roof.